Despite the successes of 1644, there was a deal of dissatisfaction among Parliamentarians concerning the conduct of the Civil War. This led to the establishment of the New Model Army (disparagingly called 'The New Noddle Army' among Royalists), a single entity replacing the loose organisation of associations which had previously constituted the Parliamentarian army. Alongside this, Parliament also issued the Self-Denying Ordinance which prevented members of the Houses of Parliament from holding military office. This removed the Earls of Manchester and Essex from field commands, along with Oliver Cromwell. The NMA was raised both from veteran soldiers and conscripts and there were strong veins of Puritan conviction and radical views among the rank and file. Discipline was rigidly enforced, training was rigorous and promotions were based on merit rather than social standing (Cromwell's famous 'plain, russet-coated captain'). Sir Thomas Fairfax was appointed Captain-General, with Sir Phillip Skippon as Sergeant-Major General of the Foot. The foot regiments were all issued with a uniform coat of the same colour- red. Common sense prevailed and Cromwell was exempted from the Self-Denying Ordinance to take up post as Lieutenant General of Horse in June 1645, with his son-in-law Henry Ireton being similarly excused and promoted to Commissary General (effectively second in command of the horse). substantial forces under Lord Goring to hold the West Country and maintain the siege of Taunton. The NMA abandoned attempts to lift the siege of Taunton and moved to besiege Oxford. Having stormed the Parliament stronghold of Leicester the King them moved back south, his initial hopes that Oxford would keep Fairfax occupied in the south undermined by fears of a shortage of provisions in the Royalist capital. NMA. He chose the latter. On the morning of the 14th June, as the fog slowly lifted, the Royalists left their initial position on a ridge between Little Oxendon and East Farndon (about 2 miles south of Market Harborough) and advanced toward the Naseby ridge where Rupert had earlier spotted some Parliamentarian horse. Fairfax had initially occupied the Naseby ridge but, under the advice of Cromwell (who feared the position would be too strong to induce an attack), withdrew his army slightly. The Royalists were not aware of the NMA dispositions until they reached the village of Clipston, about a mile north of the ridge. The Royalist frontage covered about a mile and a half, bounded by the Clipston-Naseby track on the left and Sulby Hedges on the right. Rupert, with his brother Maurice, commanded the horse on the right wing, close by the parish boundary hedges of Sulby. Sir Jacob Astley had command of the foot in the centre, with the King and the reserves (Prince Rupert's Regiment of Foot and the King's Lifeguard of Foot) to the rear. Sir Marmaduke Langdale held the left wing with his Northern horse. Directly opposite him, partially hidden on the reverse slopes and also overlapping him, were the horse regiments of the Parliament right wing, under Cromwell. Skippon, again with the majority of his foot hidden from view behind the ridge, commanded the centre, and Ireton and his horse were on the left. Sulby Hedges. 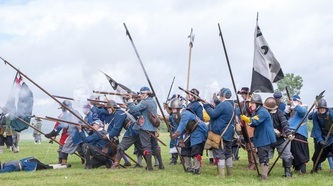 Initially engaged by the 'Commanded musketeers' (possibly including Rupert's Firelocks) interspersed among Rupert's horse, they were soon able to enfilade the advancing horsemen. Rupert tried to keep his men in hand so that horse and foot would clash simultaneously with the NMA but, perhaps driven on by the fire from the hedges, they spurred up the slope to engage Ireton's men. hard-pressed in its first test and several regiments began to fall back. Ireton, believing Rupert to have been defeated, swung a portion of his men to aid the beleaguered Parliamentarian foot. However Rupert led a second wave of horse forward, shattering Ireton's disordered wing. Ireton himself was unhorsed and taken prisoner as he charged against the Royalist foot. Most of his men fled the field, pursued as far as Naseby where the Royalist horse fell on the baggage train. Once again the Royalist horse had abandoned the field, giddy with success. The advantage was still with the King though. The Parliament left had vanished and the centre was being driven back. Now Cromwell took a hand. Even as Fairfax ordered his reserves forward to bolster his flagging centre, Langdale at last charged Cromwell's positions. The ground here was rough in places, boggy in others and the two sides had done little save watch the battle for the first half an hour. Charging uphill, and outnumbered, they were soon routed by Cromwell's disciplined troops. Leaving two regiments to continue the pursuit of the Northern Horse, Cromwell brought the weight of his divisions to bear on the left and rear of the Royalist foot. At the same time some of Ireton's horse rallied and, accompanied by Okey's dragoons who remounted and left the cover of Sulby Hedges, charged against the Royalist right. The tide of battle had turned rapidly. It was now the turn of the Royalist foot to fall back, pressed from the front by Skippon's infantry and from the flanks and rear by the NMA horse. Many threw down their weapons and cried for quarter, others fled, while some maintained a disciplined retreat. Across Broad Moor, Prince Rupert's regiment moved onto the forward slopes of Dust Hill, possibly to cover the retreat. Seeing the disintegration of his army, Charles appears to have decided to go out fighting. He gathered his Lifeguard of Horse and was about to lead them forward to try and save his centre when his bridle was seized by the Earl of Carnwarth. The Scottish nobleman snarled at his monarch 'Would you go upon your death?' and Charles was instantly dissuaded of any thoughts of a glorious sacrifice. He swung his horse around and rode back among his demoralised Lifeguard. All was over on the field now for the Royalists. There was no organised resistance left, save for the Bluecoats of Prince Rupert's regiment. They withstood two Parliamentarian onslaughts as their monarch and comrades quit the field, refusing to yield. 'The Blue regiment of the King stood to it very stoutly,' said one eyewitness, 'and stirred not, like a wall of brasse.' Eventually Fairfax led the final charge against the Bluecoats, assaulting their rear with his Lifeguard while Colonel D'Oyley of his own regiment maintained the pressure to their front. Overwhelmed by horse and foot, the last resistance was clubbed and stamped from the Bluecoats. Tradition has it that Fairfax himself took their colours, slashing through the ranks and hacking down the ensign bearing the standard. Rupert finally returned to the battlefield, but all his men could do was join the rout. Fairfax pursued the retreating Royalists as they fled toward Leicester and there were acts of savagery all the way. Many Royalists found themselves cornered when they mistakenly followed a trail into the churchyard at Marston Trussell rather than the main Leicester road. They were butchered, as were some 100 or so women when the Parliamentarians fell on the King's baggage train - the excuses that the women's Welsh accents were mistaken for Irish, or that they attempted to fight with kitchen knives and enraged troopers simply intent on plunder, are a poor defence for such an atrocity. Fairfax relieved Leicester a few days later before moving to lift the siege of Taunton and menace the south-west. The King was never again able to field a substantial, veteran army. He had lost much of his artillery and several hundred officers, not to mention his veteran soldiers. Many of his men were marched as prisoners all the way to London and the capture of his baggage train resulted in the publication of correspondence which showed he intended to seek support from the Irish Catholic Confederation. Parliament garnered much support from this and within a year the First English Civil War would be over.